Are you in need of pump repair in NYC? Since 1941, NY Pump & Motor Repair has been providing a variety of pump services with prompt and professional care. Our skilled and experienced pump technicians are available 24 hours a day, 7 days a week for pump repair, pump replacement, pump rebuild, pump installation and pump maintenance. Bu how do you know when your pump requires NY Pump & Motor Repair's professional pump repair in NYC? Many of the pump problems result from poor maintenance. Moreover, specifications of pressures and tolerance are important in fixing many of the complex problems. Chances are, you are likely to damage other parts if you attempt to do the repair on your own. Our professional pump repair technicians can complete the job efficiently. There are several types of pumps that include the centrifugal and plunger pumps. However, most of the problems with the pump tend to be similar regardless of the type of pump one is using. If the pump motor fails to start, switch off the power source (for electric pumps) and call one of our technicians. The motor may fail to start due to damage to the engine, a tripped circuit breaker, thermal overload in motor starter, or the low line current. A running pump may fails to deliver because the isolation valve is closed, the discharge or the suction line is blocked, there are dirty or worn check valves or by the use of a pump that is not primed. Have the pump shut and do not use it again until it has been checked by one of our technicians. If your pump is delivering too little it may be that the liquid is too viscous, the check valves may be worn or dirty, the suction may be starved, the suction piping may be leaky or there might be improper capacity setting. Erratic performance of the pump may be due to a number of problems that include use of a pipe that is smaller than the suction connection, damage to the check valve due to debris entering from the suction line or unsupported piping that strains your pump connections. Debris entering the pump may void your warranty. To prevent this, have one of our technicians install a screening in the suction line. Overheating may damage the interior mechanisms of your pump. The heating problem is caused by improper wiring, use of highly viscous hydraulic oil, high ambient temperature or overloading the motor by excessive discharge pressure rating. If one or more of these issues listed above occurs, make sure you call one of our certified pump repair technicians to check out the issue. We are available 24 hours a day, 7 days a week to ensure that your pumps are running properly. For more information about our pump repair in NYC or any of our other pump services in NYC, call NY Pump & Motor Repair today. NY Pump & Motor Repair- Your trusted source for pump repair in NYC! Fuel pumps can fail for any number of reasons. Not because you’re overworking your vehicle, but because the parts within are apt to wear away, as is normal for all machinery. Pumps have various repairs available, aimed to get you back on the road in no time at all. If you’re stuck, or experiencing problems with your fuel pump, you need to get to pump repair in Queens before it develops into a larger issue. Replacing a fuel pump is not necessary with the proper maintenance. So why do they fail and what can you do about it? NY Pump specializes in pump repair in Queens to get your pump back to working order without delay. 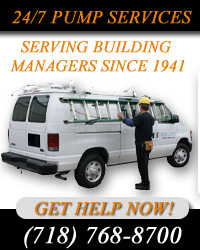 Our rates are sure to fit your budget, and our efficient methods keep downtime minimal. Our expert pump repair specialists are experienced and knowledgeable on varieties of pumps for many industries, and will restore your pump with quality results. A little history lesson is in order. There are two types of fuel pumps. They are mechanical and electrical. Mechanical pumps are mounted outside the fuel tank itself, and are much easier to maintain and repair. These pumps were once the standard. Everything changed when fuel injector engines became popular. These engines required a different type of pump. These newer pumps are the second type, electrical. These pumps are much more delicate than the original models. They require more moving parts and delicacy between the systems. These pumps are found inside the fuel tank itself, as opposed to the mechanical pumps that sit outside. Vehicles and fuel pump systems that require injection need their fuel pressure higher and more precise. The rotary displacement pumps produce a much higher pressure, perfect for the newer vehicles. This involves more fuel drawn in, and parts spinning faster. With the increase in friction, the parts are more apt to wear, corrode, and damage. That is when pump repair in Queens is important. If you get to the situation early, you can save yourself a lot of money on the other end by avoiding a larger repair job or complete overhaul of the fuel system. Pump repair is a delicate job, but we make it our specialty. Contact us today to see how we can bring our passion for pumps into your life. For more information about our professional pump repair in Queens, call NY Pump at (718) 768-8700. A water or general hydraulic pump is perhaps one of the most critical elements to any engine performance. The pump is pushing water and fluid constantly into the engine to prevent it from overheating. When the pump fails, the entire engine is short to follow. That is why pump replacement is critical. The following information is meant to help you determine if you need pump replacement in Brooklyn. At NY Pump, our pump professionals assist you in finding the pump you need for your operations. We are experienced and knowledgeable in pumps for various industries, providing you with leading brands and competitive prices to get your pump back to functioning order without delay. When you speak with us about your pump needs, we will provide you with the information you need to make an informed decision about reliable products that perform when you need them. Obviously, you’ll know if your pump fails. But these symptoms listed below will help you to notice smaller issues before they develop into larger repairs. And when you need pump replacement in Brooklyn, you know you can rely on us. This is perhaps the most obvious of the pump problems. You’ll notice water or fluid building on the underside, wherever the pump produces its output. This is noticeable by puddles, of course. But smaller leaks can be determined by placing a container below the pump and seeing what builds up. This problem is not as noticeable as a leak. But you can figure out if the belt is loose by pulling on it. This is around the bearing, where most pump problems will come up. Give it a tug or two, if it moves more than it should, use the other hand to call us for pump replacement in Brooklyn. A pump that needs replacement will usually produce some type of unwanted noise. Listen for grinding, gurgling, and other sounds that sound like internal tears. This is a clear indication of a pump that needs replacement. Check the system’s temperature gauge. If you notice increasing temperatures, then that means the bearing inside the pump is worn or wearing. This is another indicator you need pump replacement in Brooklyn right away. These are some of the most obvious ways to check a pump for possible replacement. If you notice any of these, or any other strange occurrences, give us a call to determine your replacement options. For more information about pump replacement in Brooklyn, call NY Pump at (718) 768-8700.